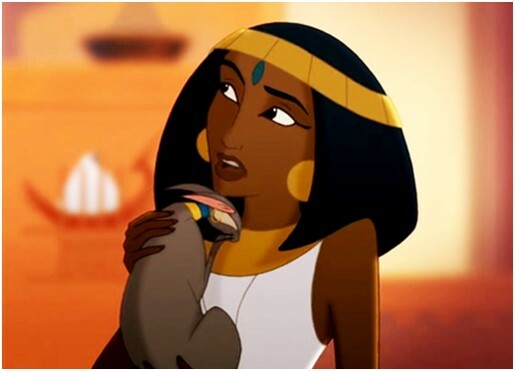 Many readers may not be familiar with the figure of Asenath, though she made her debut for modern audiences in DreamWorks Animation’s film Joseph: King of Dreams (released in 2000 as the prequel to The Prince of Egypt (1998)). She is mentioned just three times in the Book of Genesis as the “daughter of Potiphera, priest of On” whom Pharaoh gave to Joseph as a wife (41:45). Before the seven years of famine came to Egypt, as predicted by Joseph, she bore two sons (41:50) who are named Manasseh and Ephraim (46:20). Asenath is thus remembered as occupying an important place in the genealogy of Israel. Despite scant mention of her in the biblical text, however, she had quite a life outside of it. Judaic commentators were driven to explain how Jacob’s lineage could rightfully be passed through a non-Hebrew woman, and the first attempt made was among the Jewish Diaspora in Egypt, probably in Alexandria, around the time of Trajan’s rule (98-117 A.D.) (Burchard 104). Written in Greek, some scholars have placed the text among the Pseudepigrapha (though the work does not purport to have been written by anyone in particular); while others view it as an example of Midrashic tradition (Dwyer 118); and still others consider it to be a Hellenistic romance (Pervo 175; Heiserman 184-186). From the multi-cultural hub of Alexandria, the text passed through Christian hands into a myriad of Near-Eastern and European languages (Peck 2). It was quickly subsumed into Byzantine hagiography (Dwyer 118). And in the twelfth century, it was translated twice into Latin, once possibly at Canterbury, and it was this version that became the basis of a Middle English translation (Reid, “Female Initiation” 138). The Storie of Asneth was translated into Middle English sometime during the first half of the fifteenth century in a West Midlands dialect (Peck 3). The only surviving copy we have of the text, though, is preserved in Huntington Library, MS Ellesmere 26. A. 13., copied sometime around 1450 or 1460 (Peck 9). The text can be found on ff. 116r-127r. 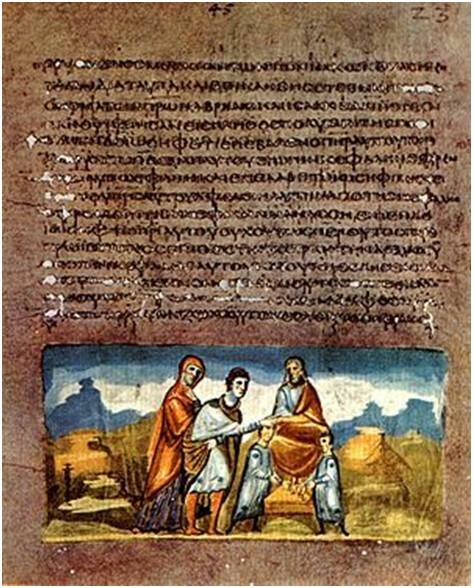 The manuscript can be divided into three parts. The first (ff. i r-v v) is in the hand of John Shirley (c. 1366-1456), book dealer and scribe famous for his copies of Chaucer, Lydgate, Hoccleve, and Trevisa. His section contains some devotional verse and poetry by Lydgate, a few lines of Chaucer’s Troilus and Criseyde with some additions from Petrarch, and some lines from John Walton’s translation of Boethius’s De consolatione Philosophiae. The second part (ff. 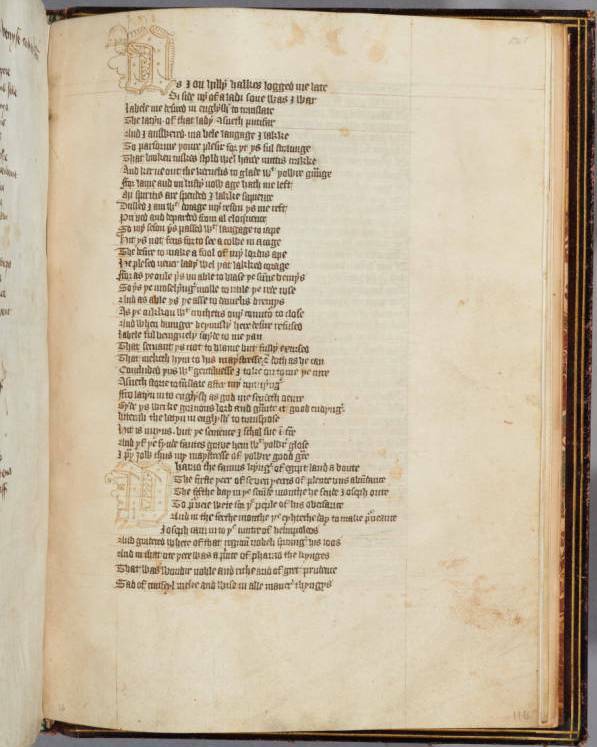 1r-115v) of the manuscript is in a different hand and includes a few more short poems by Lydgate but mainly consists of Hoccleve’s Regement of Princes. The third part is taken up by The Storie of Asneth, written in yet another hand (Hume 55). By all accounts, the manuscript appears to be a composite, but just when the three parts were bound together is difficult to ascertain. The entire digitized manuscript may be viewed here. 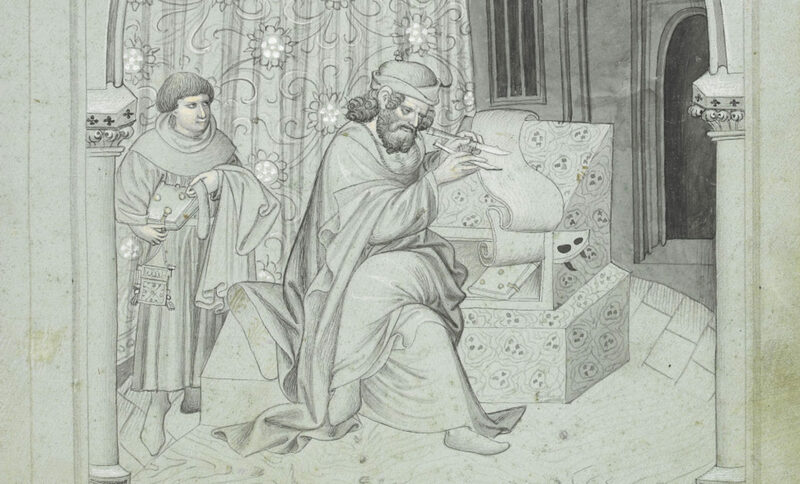 For more information, see the Digital Scriptorium Catalog Entry. What is most interesting is that on the verso side of f. v, Shirley fashioned a bookplate that displays the names of sisters Margaret and Beatrice Lynne as well as his own. Shirley married Margaret at some point between 1421 and 1441, so it has been posited that he gave the first section of the manuscript to the sisters as a gift (Peck 2-3). In the second part of the manuscript, there is also a reference (f. 115r) to “Aluredo Corneburgh de Camera Regis,” written, it would appear, in Shirley’s hand. Avery Cornburgh was a Yeoman of the Chamber to King Edward IV and was wed to Beatrice sometime between 1459 and 1467, likely bringing into this arrangement section two of the manuscript. Shirley and Cornburgh seem to have known one another and eventually joined themselves to the same family. It makes commensurate sense, then, that the first two parts were bound together, and it is quite possible that at this time, the third section was added, though this cannot be verified (Hume 55-56). Huntington Library, MS Ellesmere 26. A. 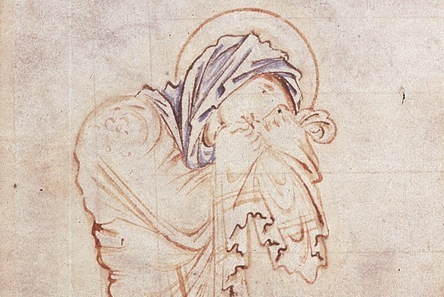 13. has, then, a strong connection to two literate, book-owning women, and in fact, another name appears in the margins (f. iii v)—“Elizabeth Gaynesford,” a friend of Beatrice. Thus, the book may even have circulated among a close-knit group of female readers. The circumstances surrounding the production of the Middle English Storie of Asneth are no less interesting. In her article “Patroness of Orthodoxy: Elizabeth Berkeley, John Walton, and the Middle English Storie of Asneth, a West Midlands Devotional Text,” Heather Reid has mounted considerable evidence that points to Elizabeth Beauchamp (née Berkeley), Countess of Warwick (1386-1422) as patroness of the Middle English text, having engaged her cleric, John Walton, an Augustinian canon at Osney Abbey, as translator. We can observe a decidedly female interest in vernacular translation of this text on the other side of the Channel as well. 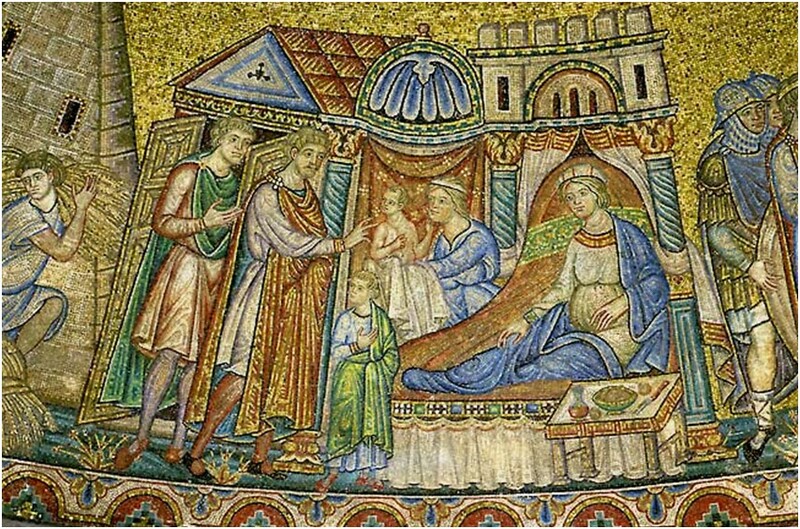 Vincent of Beauvais included an abbreviated version of Asenath’s story in his Speculum historiale (1253), and in 1332, Jeanne de Bourgogne, wife of Philippe VI de Valois (r. 1328-1350), commissioned Jean de Vignay to translate this text into French, producing the Miroir historial (Lusignan 497-498). So what made the account of Asenath so attractive to female readers? Of the dew of rosis there, that are of gret plesance. As soon as the “man com doun fro hevene” (l. 415) departs, Joseph returns to the house. He has received knowledge in a dream that Asenath is to be his wife, and the very next day Pharaoh marries them. We are then told: “And after Joseph knewe his wyf and sche conceived sone, / And bar Manasses and Effraim – this was here procreacion” (ll. 682-683). The remainder of the story deals with a threat upon Joseph’s life and a dramatic combat. The text reads like a romance—ever a much-loved genre—but it is also biblically based and hagiographical in tenor. The Storie of Asneth shares similarities with accounts of heroic Old Testament women, like those found in the books of Ruth, Esther, Tobit, and Judith (West 76). And as Susan Bell notes, “Throughout the Middle Ages, following the teachings of the early Christian fathers, women were exhorted to model themselves on biblical heroines” (158). In one sense, the text could have been conceived of as an exemplum, demonstrating the “ethical virtues” of “self-discipline, penitence, humility” (Kee, “The Socio-Religious Setting” 185). Such a didactic yet romantically appealing narrative could have served well for instruction within a household (Peck 4-5). In the first section of her article “The Storie of Asneth: A Fifteenth-Century Commission and the Mystery of Its Epilogue,” Cathy Hume also demonstrates that the Middle English Storie of Asneth reflects fifteenth-century trends in hagiography and textual consumption, particularly by women, and she argues that what made the text so well received is that it presents an exemplary account of pious married life. The text shows that women can be religious and married, not forced to choose between the two, something that we know real women struggled with, like Margery Kempe. This makes figures like Asenath more imitable, a subject upon which Catherine Sanok has also had much to say. 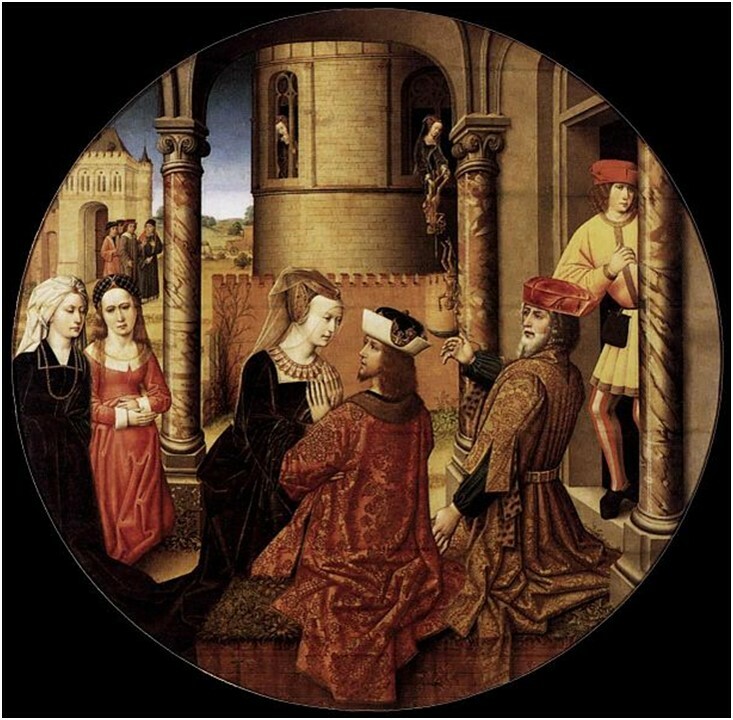 In an earlier article (“Female Initiation Rites and Women Visionaries: Mystical Marriage in the Middle English Translation of The Storie of Asneth”), Heather Reid discusses the text also in relation to accounts of women visionaries and writes a great deal about Asenath with respect to sacred marriage, chastity, and mysticism—all important topics also for this time period, as Dyan Elliott likewise attests. However, Asenath’s actual marriage to Joseph is also quite intriguing. Asenath is an admirable young woman but so too is her relationship with Joseph, though little has been said about the spirituality of her human marriage. However, for the majority of the female lay readership of Asenath’s story, this would have been the subject of more immediacy. When Joseph comes to see Asenath after her conversion—both having received a vision from God—he “[…] streihte out his hand, and loveli gan her brace. / Thei kiste then bothe in same with cuntenance excellent” (ll. 621-622). Asenath welcomes him, as she did before, yet this time she moves to wash his feet, a gesture reminiscent of Christ towards his disciples. She tells Joseph, “I schal hem wasshe […] / Thi feet ar myn owne feet, thi handdis also with alle, / And thi soule ys my soule: thu are thn myn owen fere” (ll. 627, 630-631). While she exhibits humility towards Joseph by washing his feet, she also declares their relationship to be reciprocal: he is hers as much as she is now his. For all intents and purposes, she describes the two of them to be the biblical “duo in carne una” (Mark 10:8). This paints a rather encouraging picture of human love and marriage; indeed, it is the prelapsarian ideal in its parity. For a fifteenth-century female audience engaging with this text, this is not only enlightening and inspirational; it is also empowering. The union Asenath is establishing with Joseph is Edenic in quality, and this is something for which Joseph also seems to strive. Both are represented as exceptional human beings who achieve an extraordinary relationship, and their union is one in which God is the center. In fact, their marriage is brought about through God, once Asenath—who possesses a noteworthy degree of control over her own destiny—decides to dedicate herself to “the heyhe Lord God of Joseph, almyhti in His throne” (l. 349). And the bond produced from such a relationship is one of equal affection and regard, of selflessness and charity. The presentation of marriage in The Storie of Asneth is one in which both parties are able to honor God through their relationship with one another, a union not only approved of, but promoted by God—something that would have resonated well. On so many counts, The Storie of Asneth would have been a captivating text for a fifteenth-century female readership. Women were in no way ignorant of the fact that they endured the insidious yoke of patriarchy in both temporal and spiritual spheres, even though Judeo-Christian theology is very clear that women’s souls are equal. It is no surprise, for instance, that Catherine of Alexandria was such a popular saint, as discussed in a blog post by Mary Helen Galluch. Asenath is less radical than Catherine, though, in her devotion. And she weds and continues the family line, marrying, as it were, piety and the lay life—much as many medieval women did. But her example lends a dignity to the lay life, and there are a number of parallels between Asenath’s actions in the text and those of the righteous woman of Proverbs 31. While on the one hand, Asenath remains circumscribed by patriarchal society (as the woman of Proverbs 31 is also) and can be seen as something of a safe, contained model; on the other hand, her claim to be Joseph’s peer in marriage and her exemplary conduct as a human being (regardless of gendered expectations) bring her far above the level of vessel and drudge. She is not a beautiful but passive romance heroine, for she energetically shows physical charm to be of far less importance than virtuous actions and that “a woman who fears the Lord is to be praised” (Proverbs 31:30). “The Storie of Asneth.” Heroic Women from the Old Testament in Middle English Verse. Ed. Russell A. Peck. Kalamazoo: Medieval Institute Publications, 1991. 1-23. Bell, Susan Groag. “Medieval Women Book Owners: Arbiters of Lay Piety and Ambassadors of Culture.” Women and Power in the Middle Ages. Ed. Mary Erler and Maryanne Kowaleski. Athens: University of Georgia Press, 1988. 149-187. Burchard, Christoph. “The Importance of Joseph and Aseneth for the Study of the New Testament: A General Survey and a Fresh Look at the Lord’s Supper.” New Testament Studies 33 (1987): 102-134. Douglas, Rees Conrad. “Liminality and Conversion in Joseph and Aseneth.” Journal for the Study of the Pseudepigrapha 3 (1988): 31-42. Dwyer, R. A. “Asenath of Egypt in Middle English.” Medium Aevum 39 (1970): 118-122. Hartman, Geoffrey. “Midrash as Law and Literature.” The Geoffrey Hartman Reader. New York: Fordham University Press, 2004. 205-222. Heiserman, Arthur R. The Novel before the Novel: Essays and Discussions about the Beginnings of Prose Fiction in the West. Chicago: University of Chicago Press, 1977. Hume, Cathy. “The Storie of Asneth: A Fifteenth-Century Commission and the Mystery of Its Epilogue.” Medium Aevum 82 (2013): 44-65. Kee, Howard C. “The Socio-Cultural Setting of Joseph and Aseneth.” New Testament Studies 29 (1983): 394-413. Kee, Howard C. “The Socio-Religious Setting and Aims of ‘Joseph and Asenath.’” Society of Biblical Literature 1976 Seminar Papers. Ed. George MacRae. Missoula: Scholars Press, 1976. 183-192. Kraemer, Ross Shepard When Aseneth Met Joseph: A Late Antique Tale of the Biblical Patriarch and His Egyptian Wife, Reconsidered. Oxford: Oxford University Press, 1998. Lipsett, B. Diane. “Aseneth and the Sublime Turn.” Desiring Conversion: Hermas, Thecla, Aseneth. Oxford: Oxford University Press, 2011. 86-122. Liptzin, Sol. “Lady Asenath.” Biblical Themes in World Literature. Hoboken: KTAV Publishing House, Inc., 1985. 62-73. Lusignan, Serge. « Le temps de l’homme au temps de monseigneur saint Louis : le Speculum historiale et les Grandes Chroniques de France ». Vincent de Beauvais : Intentions et réceptions d’une œuvre encyclopédique au Moyen-Âge. Ville Saint-Laurent, Québec : Les Éditions Bellarmin, 1990. 495-505. Nisse, Ruth. “‘Your Name Will No Longer Be Aseneth’: Apocrypha, Anti-Martyrdom, and Jewish Conversion in Thirteenth-Century England.” Speculum 81 (2006): 734-753. Peck, Russell A. Introduction. “The Storie of Asneth.” Heroic Women from the Old Testament in Middle English Verse. Ed. Russell A. Peck. Kalamazoo: Medieval Institute Publications, 1991. 1-15. Pervo, Richard I. “Joseph and Asenath and the Greek Novel.” Society of Biblical Literature 1976 Seminar Papers. Ed. George MacRae. Missoula: Scholars Press, 1976. 171-181. Reid, Heather A. “Female Initiation Rites and Women Visionaries: Mystical Marriage in the Middle English Translation of The Storie of Asneth.” Women and the Divine in Literature before 1700: Essays in Memory of Margot Louis. Ed. Kathryn Kerby-Fulton. Victoria, British Columbia: ELS Editions, 2009. 137-152. Reid, Heather A. “Patroness of Orthodoxy: Elizabeth Berkeley, John Walton, and the Middle English Storie of Asneth, a West Midlands Devotional Text.” Devotional Culture in Late Medieval England and Europe: Diverse Imaginations of Christ’s Life. Ed. Stephen Kelly and Ryan Perry. Turnhout: Brepols, 2014. 405-441. Sanok, Catherine. Her Life Historical: Exemplarity and Female Saints’ Lives in Late Medieval England. Philadelphia: University of Pennsylvania Press, 2007. Vikan, Gary. “Illustrated Manuscripts of the Romance of Joseph and Aseneth.” Society of Biblical Literature 1976 Seminar Papers. Ed. George MacRae. Missoula: Scholars Press, 1976. 193-208. West, S. “Joseph and Asenath: A Neglected Greek Romance.” The Classical Quarterly 24 (1974): 70-81. Translating a poem is a tall order. There are many factors to consider and issues which must be negotiated in the process. Which is better—literal accuracy or stylistic approximation? We have asked modern translators from the Medieval Institute and English departments at Notre Dame to share translations of their favorite Old English poems, digitally displayed alongside their medieval counterparts. Recitations, both in Old and modern English, will likewise be featured as complementary audio files, accompanying both versions of each respective poem translated. Today, we’d like to draw your attention to the first of these translations, which is now available on our site. “Almsgiving” is contained in the Exeter Book, a collection of Old English poetry copied c. 970, and thus the oldest surviving collection of English literature in the world. Jacob Riyeff, a PhD candidate in Notre Dame’s Department of English, has translated this beautiful poem, and you can read it below, as well as hear recordings of him reciting the Old English text and his own modern English translation. We hope you enjoy! ond for ussum dryhtne doma selast. and the Lord glories in the welcome glow of her light. with the gracious gift of her alms. Previously published in Dappled Things 9.3 (2014) and “Lofsangas: Poems Old and New,” a chapbook by Jacob Riyeff (Franciscan University of Steubenville Press, 2015). Have you heard of medieval anchoresses? Most people haven’t. Anchoritism was a fascinating (and odd) phenomenon that happened all across Western Europe and has roots in the early Christian desert hermit tradition. An anchoress was a laywoman who wanted to withdraw from secular life and live instead in solitude, enclosed in a small room attached to an exterior wall of a church or castle, devoting the rest of her earthly life to Christian devotion and such works of service as she could perform from her cell (embroidering liturgical cloths is one example). She would have required a patron or an income from landholdings or other source to support her needs, such as food, water, and clothing. Among women this phenomenon was first documented in England in the twelfth century and became an increasingly popular choice that continued well into the sixteenth. Several handbooks were written for these women, at first in Latin and then in English. Arguably the most famous is the Ancrene Wisse, composed in the early thirteenth century, of which an impressive seventeen manuscripts survive. This lifestyle choice seems very strange to us today. Who among us would choose to confine herself to a one-room cell for the rest of her life? Wouldn’t you get claustrophobic, or addled by cabin fever, or die from lack of exposure to sunlight? Wouldn’t you just get bored? Not to mention the deeper and off-putting mythologies that have grown up about anchoresses: rites of the dead were said over them at enclosure, they were bricked into their cells, they dug their graves in their cell floors with their hands a little bit every day, they never saw anyone, and their cells were always on the north side of the church so they’d suffer more from cold (they were just that penitential). Perhaps the most chilling myth is that anchoresses were all walled up in their cells, like Fortunato in Edgar Allen Poe’s “The Cask of Amontillado.” In fact, while sometimes the exterior door of the cell was bricked in, that was not always the case. Further, the ceremony happened with great solemnity and was a voluntary commitment on the part of the anchoress. Various medieval pontificals, service books for Church bishops, record these rites. 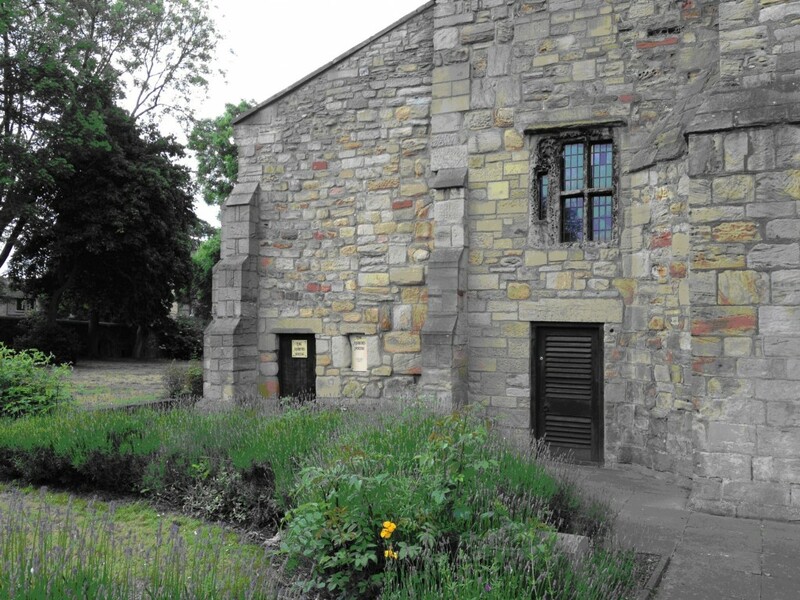 The office in the fifteenth-century pontifical of Bishop Lacy calls for the door of the cell to be built up. Others, like the sixteenth-century pontifical of Archbishop Bainbridge directs the anchoress’s door to be firmly shut from the outside. The image above, from an early fifteenth-century Pontifical held at the British Library, accompanies an enclosure rite that begins “Ordo ad recludendum reclusum et anaco/ritam,” or “Ordo for enclosure of a recluse and anchorite.” The bishop makes the sign of the cross above an anchoress entering her cell before enclosing her. 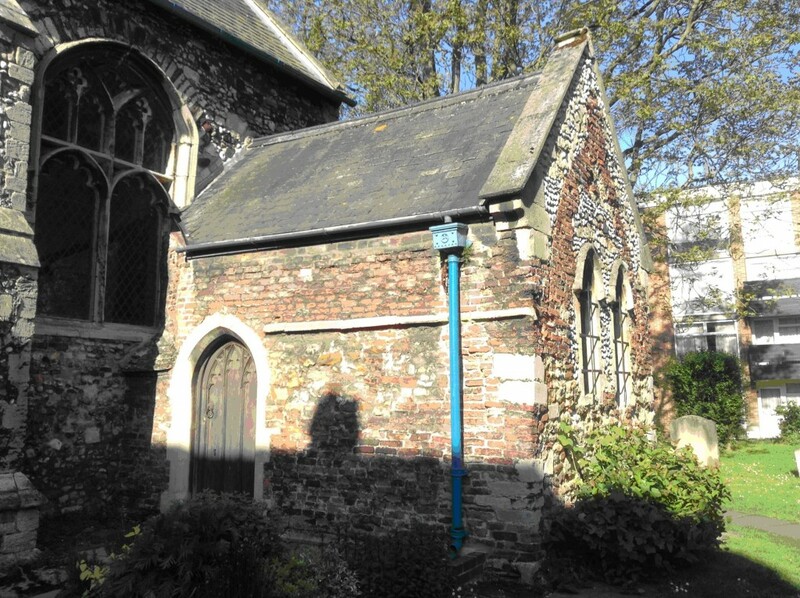 As part of the research for my dissertation-in-progress, a study of lay English women’s literacy in the thirteenth century, I’m visiting a number of medieval English churches that hosted anchorholds (or are rumored to have done so) and chronicling it on my blog. Two of the sites still retain their medieval anchorholds, one pictured at the top of the post and the other below. Interestingly, both have exterior doors. There is, of course, much more to be said about the exterior fabric of these cells and what has changed over the course of five or six hundred years than is room for here. Nonetheless, the evidence demonstrates that anchoresses’ access to the world was a more complex matter than myth would have you believe. F. M. Steele, “Ceremony of Enclosing Anchorites,” in Anchoresses of the West (London, 1903), pp. 47-51. Rotha Mary Clay, The Hermits and Anchorites of England (London, Methuen 1914).